The Geordie comedy duo are back on our screens! ant mcpartlin and declan donnelly returned to our tv screens! Ant McPartlin will make an emotional return to TV this weekend in the new series of Britain's Got Talent. It's his first full show back, since stepping down from on-screen commitments last year following a drink-driving conviction. In the ITV variety show, a teary McPartlin is embraced by his co-presenter Declan Donnelly during a musical performance by school children. Paying tribute to his friend and co-presenter, McPartlin said at the time: "I really don't feel like I can accept this award this year - the one reason we've won the award this year is because of this guy. "His hard work, dedication, wit, funniness and being the best mate there is out there, I love you man - thank you." Holly Willoughby stepped into McPartlin's shoes to join Donnelly in presenting the last series of I'm A Celebrity... last year. 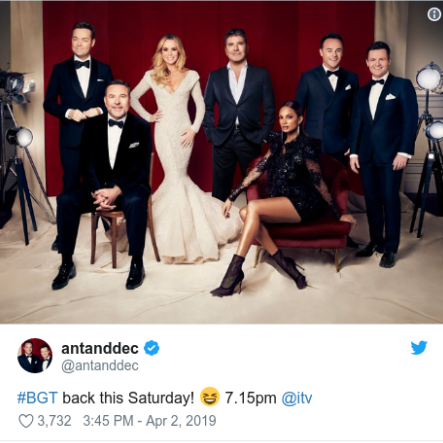 Presently, as well as the official return of the Geordie twofold act, Saturday evening's show will see judges Simon Cowell, Amanda Holden, Alesha Dixon and David Walliams all return too, to give their verdicts on a range of wannabe performers at the Palladium and The Lowry in Manchester. It all begins with McPartlin and Donnelly in a skit which will see them jump into a taxi to the London venue, with McPartlin declaring: "Right, let's get on with the show." The comedy team postponed this year's series of their own show, Saturday Night Takeaway, and it's not because of return until 2020, ITV confirmed in August. do you love the geordie duo? Welcome Ant back to our screens!